Motorcycle Helmet cameras are becoming ever more popular on UK roads. Recording your ride allows you to capture and relive the best moments in glorious HD. Editing your footage is easy, allowing it to quickly shared online. More seriously, many motorcyclists are wearing cameras to protect themselves from bad drivers. Filming in public is completely legal and good quality video footage can be an important piece of evidence if you are involved in any kind of accident or confrontation on the roads. As always on Begin we look for the best options out there that offer good quality at reasonable prices. If you are ready to buy and just want a quick sanity check before pulling the trigger, then check out the comparison chart below for the best motorbike helmet cams in each category. If you are in research mode then have a look at the in depth reviews which look more closely at each option. 1080p: 1080 horizontal lines of vertical resolution. Basically this will provide the same quality of picture as a standard high definition TV. 720p: This is equivalent to a standard (ie non HD) television picture. Frames Per Second (FPS): The number of times per second that an image is taken. A higher FPS produces a higher quality picture. Memory Card: This is used to store your recorded video. WiFi: Allows you to connect the camera to your computer wirelessly for retrieving video. This is by the far the most expensive camera on the list. It produces absolutely stunning high resolution images and can film up to 4K HD. If filming at 1080p it works at 120fps which ensures silky smooth playback. GoPro gear is highly regarded and comes with a mountain of in built features and settings. If you’re the kind of person who loves to tweak everything and is happy to invest the time in learning all its capabilities then this camera will deliver truly stunning and highly detailed video. For those of us who prefer to just click record and ride the GoPro Hero5 has a some simple voice control settings which allows for hands free control at low speeds. It is completely waterproof and very durable, and will shrug off any weather that the UK can throw at it. It also comes packaged with various mounts which will allow you to fit on a helmet or handlebars straight out of the box. This GoPro model has a built in touch display screen, admittedly this is not much use when actually riding, but it makes set up and configuration very easy and allows you to playback video on the roadside. One annoying thing to be aware of with this camera, you will need to buy a memory card as there is no internal memory to record your video on. Make sure to buy a good sized one of at least 64GB as the high quality images on this camera take up a lot of space. This 64GB Sandisk extreme memory card comes highly recommended. To sum up, this is an awesome piece of kit which will ensure crystal clear recording of your ride. Whilst it is on the expensive side, recent price reductions have made it a relative bargain when looking at the quality of both the pictures and the build. This is one of the better low cost GoPro style competitors. It seems like they have taken a lot of, shall we say “inspiration” from the look and function of the GoPro and it evens uses the same mounting system and accessories! It shoots a very decent 60FPS at 1080 HD, this is plenty for keeping up with your ride and will produce good clear images for playback. This camera also offers 4K Ultra HD recording although many users report that the 4k mode is disappointing and doesn’t stand up to scrutiny at close range. The camera comes with two rechargeable batteries which is handy and a USB charger. Battery life is average, you’ll get about 90 minutes out of each one. Its is fully waterproof down to 100 feet, so no worries about handling the weather. The Akaso comes with a large array of accessories and mounts, importantly it includes a helmet mount for us motorcyclists. One interesting feature is the wireless wrist remote which allows full control of the camera without fiddling with your helmet. Not much use on the move with thick gloves on but makes life easier when at the side of the road. Whilst video quality is decent for the price, it doesn’t produce the same silky smooth shots you will get with the GoPro. A decent camera at a great price, will happily record your ride and spit out good quality footage at the end of it. If you can accept some compromises on video quality then this package offers good value. Shoots 30 FPS at 1080 HD so the video can get grainy at higher speeds and there will be some lack of clarity in the detail. There is no 4K recording option. This is another one that comes with two rechargeable batteries although it doesn’t come with a charger. You can use a standard USB cable to charge it up. It works well in the wet and is fully waterproof. As seems to be common with these cheaper cameras it comes with a huge array of fixings, mounts and straps. You should be able to attach it to just about anything without a problem. There’s no escaping it, this is a cheap camera and it comes with some quality and build issues. The control interface is frustrating and the menus are confusing. An average camera at best, this will just about do the job of recording your ride. However, if you can deal with it’s shortcomings you can’t argue with the price. This cheap and cheerful camera is very small and portable and comes with some impressive features. Again you are going to get 30 fps at 1080p and 60 fps at 720p which is pretty standard for the cheaper cameras. The Powerlead is showerproof but not suitable for diving. Included are an array of brackets, clips, clamps and sticky pads. Getting it attached to your helmet or bike is a simple process. This is a super cheap camera, the user manual comes with a dodgy Chinese translation and the sound quality is poor. Picture quality is average and you may struggle to make out number plates and details in the distance. If you are looking for an entry level motorcycle camera then the Powerlead is an option. You get an incredible amount of camera for the money along with numerous accessories. However if video and build quality is important to you then look elsewhere. The following cameras are currently not available on Amazon. You may find them at other retailers or they may come back into stock on Amazon so it is always worth checking the links if you are interested in these models. This is one of the lightest action cameras out there. At 80x42x27mm and coming in at only 97g it is extremely portable. For helmet mounting this lightweight design and low sense of gravity make it is one of the easier cameras to fit to the side or top of your helmet. The Stealth films at 30 fps in HD which means that whilst the footage looks OK, there are some motion artifacts at high speed and the video is not perfectly clear and crisp like the GoPro. If you are happy to film at less than full HD (960p) the camera will film at 60 fps which allows for better motion playback at the expense of picture clarity. The big feature on the Drift is a 300 degree rotating lens allowing the orientation of filming to be quickly and easily changed. This is particularly good for us motorcyclists as it allows for much flexibility when mounting to your helmet. The Stealth also has a fairly impressive battery and you should be able to get 3 hours of 1080p recording out of a full charge. As with most of these helmet cameras you will need to purchase a MicroSD memory card before filming. This is a well designed small and lightweight camera well suited to motorcycle helmets. The Contour Roam 3 is another reasonably small and lightweight camera. Whilst it is heavier and slightly larger than the Stealth it does have the advantage of being fully waterproof straight out of the box. You can indeed go swimming in it! Again, when compared to the GoPro you are looking at a compromise on the frame rate with the Contour filming at 30 fps in 1080HD. The Contour scores points by being one of the few cameras to include a MicroSD card as standard. Whilst it is only 8GB this is enough to get you out and filming as soon as you open the box. They have also included several mounts in the box and the helmet fixing is actually pretty good. Another great feature for motorcyclists is the easy on slide switch. This is very easy to operate with gloves on and provides instant recording. The video footage can be somewhat grainy at times due to the low framerate at full HD. Also whilst it has a solid 3.5 hour battery life, the battery itself is not removable and takes a similar amount of time to fully charge up. Another well designed camera with video quality compromises. Where it does score highly is in the value provided. It is ready to use with memory and mounts straight out of the box. 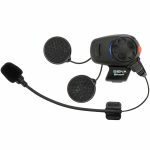 Interested in a motorcycle intercom?